In the last week, three couples that I have some connection to lost a child. Two of the deaths were the end result of a long struggle with severe medical problems, while the other was because of a car crash. I have worked with people on grief for many years, and spoken with hundreds of parents who lost an offspring, usually as a result of a drug overdose. But I have also counseled several who lost a young child or baby, and it is clear to me that burying a child is the most painful of all human experiences. This loss will always be with you, and may, in fact, define you. If you have another child, you should talk to him or her about what happened in clear and honest terms. Do not lie or us euphemisms. Your child or other children know that something incredibly awful has happened – children are incredibly attuned to their parents moods, facial expressions, body language and presence. Even if your other child is 2 1/2 years old, tell them. It is also very important that you tell your other child (children) that he or she is not sick nor likely to die. All too often, when kids see this kind of thing happen to a sibling, they wonder if it will happen to them and they never ask or tell an adult what they are worrying about. Your friends and family don’t know what to do or say. Some will avoid you completely, because they do not want to intrude or do not know what to say. Others might hang around or call all the time, hoping to comfort you with their presence or some activity. Though this is very difficult, it will help everyone involved (including you) to let people know what you need. And please be aware that what you need during the first week may be different than month three or year two. The previous point may be tough to accept. You might think, “Who cares if my sorrow makes other people uncomfortable? Why should I worry about them when I’m the one who has lost my world?” Those are fair thoughts, but you still need other people. As does your family. Being clear that you need space or company or words of condolence or silence will ultimately help you. There may be some people who say things like “his time was up” or that “God called her home” or “he is in a better place” or that it “was God’s will.” You may find it consoling, or you might find it incredible offensive and aggravating. People that say this to you mean well. They just don’t know what else to say. If it offends you, let them know and ask them not to repeat it. Regarding your spouse, partner or ex: they are the person that also suffers this tragic loss the worst. He or she will grieve differently than you. It may come out as constant crying, silence, rage, withdrawal, throwing oneself into work, talking, some combination of all of the above, or perhaps something else entirely. I have seen couples get angry with each other at how the other grieves. You have each experienced the most terrible thing, don’t compound it by attacking each other. Even though you are in a daze, you need to leave your home each day. Whether it is to go to work, school, church, therapy, the gym, grocery shopping or something else, you must venture out into the world. Time is going to feel incredibly slow and miserable, and walking around the house from room to room and staring at the walls or outside will not help. This is extremely common behavior. Consider going to a support group or therapy. This may be an anathema to you, but a support group will be filled with people who have the same experience and can show you how they got better or worse. The support groups can be helpful years down the road, when other people have a hard time comprehending that this loss is still very much an active part of your life. A therapist who specializes in grief can provide positive support from a neutral source over a period of months or years. Waking up each day may be the worst part of your day – as you come to and remember your loss and the wave of pain washes over you. The days will keep coming. I have no special words of comfort – there are no special words. There is the aforementioned advice, which may or may not work. You may not want it to work, but please consider trying. On August 8th, I toured the Steven A. Cohen Military Family Clinic in Philadelphia. It is located on the University of Pennsylvania campus, just west of Center City. There are other clinics in NYC, San Antonio, Dallas, El Paso, and Fayetville, NC. There are several more slated to open within the next year. To find the contact information for each clinic, click here. Steven A. Cohen was born in New York. He went to Wharton and made his money on Wall Street. The 2017 estimate of his wealth is around $13B. His son served in Afghanistan. Mr. Cohen and his wife established the Cohen Veterans Network in 2016 with an initial donation of $275M. The clinics currently provide services for veterans, reservists, and National Guard members. They also provide counseling for family members. They see people for one hour a week. If people need a higher level of care, the professionals at the clinic work tirelessly to find appropriate services. I had the pleasure of meeting with Pete Freudenberger, a social worker who earned his MSW from UPenn. He is also a veteran with a very interesting story. He is the Outreach Manager for the Philadelphia clinic and can be reached at pfreu@upenn.edu. 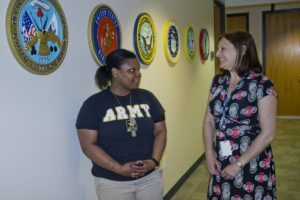 The Steven A. Cohen Military Family Clinic was featured in an article on Philly.com on June 15. You can read it here. This photo was taken from the aforementioned article on Philly.com. Are You Suffering Work Burn Out? Social Workers and other helping professionals have high rates of burn out. People in the field will talk about it without describing how to actually look for it. I’ve put together a 20-question self-quiz that professionals can take to evaluate themselves. While it is not scientific, it should give you a good feel for where you are and whether (and what) you need to change (this can be used to gauge burnout in other professions as well, though questions 2 and 18 should be altered or eliminated). For a printable version of this, click here. Do you get weekly supervision of at least one hour per week? Does it take more than 15 minutes for you to fall asleep at least 2x a week? Do you wake up in the middle of the night at least 2x a week? Do you sleep longer or shorter than you planned at least 2x a week? Do you wake up and feel like you haven’t had a restful sleep at least 2x a week? Do other people get credit for your work? Are you happy with your exercise routine? Does your work schedule or stress cause problems with your family (parents, significant other, kids) at least twice a month? Do you take an out-of-state vacation at least once a year? Do you feel like you have neglected friends? Do you feel like you have neglected hobbies? Are you in therapy at least 2x a month? Do you have conflicts (passive or aggressive) with co-workers at least 2x a month? Do office politics interfere with your job? Can you talk to someone about work stress other than your significant other? Have you had a client or student die within the last year? Does your job cause you to compromise any of your values?